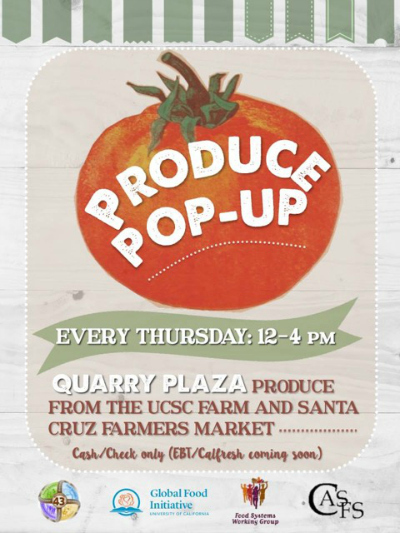 UCSC’s Center for Agroecology & Sustainable Food Systems features a 'Produce Pop-Up,' feature organic produce at Quarry Plaza each Thursday. It’s hard to do your best academically when you’re not eating well, but that’s the dilemma facing many University of California students. “Students are sacrificing their food security in order to fund their other college expenses—we’re trying to improve that situation,” says Diane Villalba, a UC Santa Cruz biochemistry major and food access intern. Villalba is part of system-wide effort sponsored by the UC Global Food Initiative (GFI) to address the challenges of students trying to cope with the rising costs of tuition, rent, books, and other expenses. Results of last year’s UC Undergraduate Experience Survey conducted across UC campuses show that as many as one in three are dealing with the financial squeeze by skipping meals. Results of a new survey funded by GFI that focuses specifically on UC students’ food security will provide further details of a problem that is not only widespread throughout the UC system but across the country. UC’s GFI has made it a priority to help students get reliable access to healthy, safe and affordable food that they enjoy. The GFI Food Access and Security Subcommittee, co-chaired by Tim Galarneau of UCSC’s Center for Agroecology & Sustainable Food Systems (CASFS) and Ruben Canedo of UC Berkeley’s Centers for Educational Equity and Excellence (CE3), has established working groups on every UC campus to develop food access solutions, from operational to aspirational. At the upcoming California Higher Education Food Summit at UC Irvine January 21-23 (cafoodsummit.com) working group members will give an overview of their efforts over the last six months, including discussion of a food security survey by the UC Division of Agriculture and Natural Resources’ Nutrition Policy Institute. Survey results are expected to be released in July. At UC Santa Cruz, professor of anthropology Nancy Chen and Galarneau help lead a working group of faculty, staff, and student GFI fellows and interns looking for ways to improve food access for both undergraduate and graduate students. Chen, a professor of anthropology, also directs the Blum Center and advises graduate students researching income inequality, food security, and housing challenges as part of a Food Security Action Research Hub. “This year we’re addressing both infrastructure and communications questions, as well as analyzing existing programs to find ways they can be improved, and developing recommendations for new methods to improve student support,” says Galarneau. Recent UCSC graduate and CASFS staff member Crystal Owings explains that GFI interns are mapping campus facilities that might be used as food pantries and distribution sites. “They’re looking at sites such as the Redwood Building, Academic Resources Center, the new Cowell Ranch Hay Barn, and noting whether they have storage and refrigeration capability, nutrition education and working space, how visible and accessible they are in terms of nearby bus stops and parking, and how they might serve current and new programs,” she says. Villalba, an intern with the working group, also notes that they hope to identify a site to hold cooking workshops supported by campus partners committed to student nutrition and health, and expose students to additional resources available to them. Working group interns are also looking at ways to improve communications and marketing to students who might qualify for federal assistance through the Cal Fresh Electronic Benefit Transfer (EBT) program and Slug Support-based assistance provided by campus. Slug Support provides meal vouchers and Safeway cards along with other financial help to qualified UCSC students through an intake and assessment process designed to ensure that students have a “road map” toward their health and wellness. Removing barriers for work study students to qualify for support via CalFresh through system-wide engagement in the implementation of AB 1930. 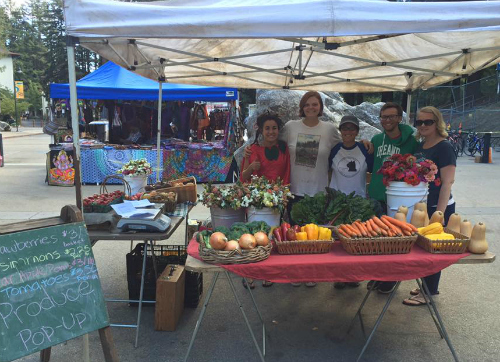 Creating a “market-match” token system for students to use at the newly established weekly organic produce stand located in the Quarry Plaza. The program would provide up to $10 in matching tokens for EBT credit usage through the SNAP program (formerly known as food stamps) per week. In developing programs, the working group is also focused on removing the possible stigma attached to seeking and using support. “We want to advance systems that are accessible and empowering rather than stigmatizing,” says Galarneau. For example, the dining meal vouchers are the same as prospective students and campus guests receive for eating in the dining hall, and cooking or nutrition workshops would be advertised and open to all students. The full results of this initial year’s systemwide working group efforts, including recommendations for improving campus food security, are expected to be presented to the UC Regents in July.